Place all of the ingredients for the stock in a wok and bring to the boil. Once boiling, reduce to a low simmer. Prepare the sea bass fillets by removing the pin bones. Finely dice the chillies and finely chop the garlic clove. Pick the leaves from the coriander stalks and roughly chop the leaves. Mix these ingredients in a bowl with the sunflower oil and then rub this mix onto the sea bass fillet. Roll the sea bass lengthways and secure with a skewer. For the pak choi: separate the leaves and wash under cold water. For the noodles: place the rice noodles in boiling water and allow to soften for three minutes. Drain and run under cold water. Finely dice the red chilli. Mince the garlic clove. Roughly chop the peanuts. Finely slice the spring onions. Squeeze the juice from the limes and roughly chop the mint and coriander. Mix these ingredients in a bowl with the soy sauce. Add the cold noodles and mix with the dressing. To cook the sea bass: place the sea bass fillets on a grill above the simmering stock. Place the lid on the wok and bring the water up to a slow boil. Cook the fish for 4 to 5 minutes and check it is cooked by ensuring that the thickest part of the fillet is white. When it is cooked remove the skewer. Whilst the fish is cooking, heat a frying pan with the peanut oil and stir fry the pak choi for 2 minutes until the stems are soft and the leaves have wilted. To serve: place a neat pile of noodles in the centre of the plate. 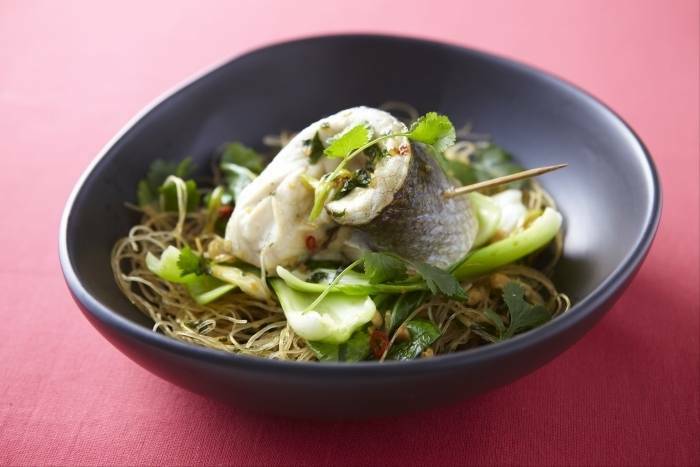 Top with a few leaves of pak choi and then place the sea bass fillet on top. Finish the plate with a drizzle of the soy dressing and a sprinkle of fresh coriander.